The Randolph College for the Performing Arts production of Noise opened on Tuesday at the Annex Theatre. This is the first English performance of Maria Milisavljevic’s play Beben (“Quake”), originally written in German. It was first translated by Milisavljevic with David Jansen for a staged reading in 2016. It’s been further updated by Director Birgit Schreyer Duarte and the student cast for this production. The translating and updating included adding Canadian and Toronto references, which made the text more engaging. The play is in two acts with an intermission, and I have to admit that at the end of the first act I was struggling to understand what was happening. I had an easier time following the changing narratives and was engaged with the play in the second act. By the end, happy ending not withstanding, I was actually feeling kind of depressed. Noise is set in a dystopian near-future and is basically a struggle between good and evil. We know in advance that good is going to triumph because we know in advance that there’s a happy ending. There are also narrative threads of forgiveness, fear, and blind allegiance to the government. A lot of the first act focuses on a group of five ‘millennials’ hanging out, taking selfies, posting to Facebook, playing video games, and talking while they remain oblivious to what’s happening outside. When they do notice, it takes a long time before a couple of them decide to go outside and move their neighbour’s body that’s been lying in the street for weeks. Finally the other millennials are forced to engage, and in the second act they fight evil and are victorious. At a huge cost. If it sounds as if this is a linear story, it isn’t. It’s like reading your Facebook feed. First a news item, then some gossip, a cat picture, someone’s update that makes you smile, another news story, an ad, back to the first news item, and on it goes. I’m used to reading it, not so used to seeing it. It took some getting used to. The first act especially was a minutes of this, a couple of minutes of that, back to this, on to the other. Director Duarte did an amazing job keeping the action moving and keeping the transitions from one part of the stage to another seamless. 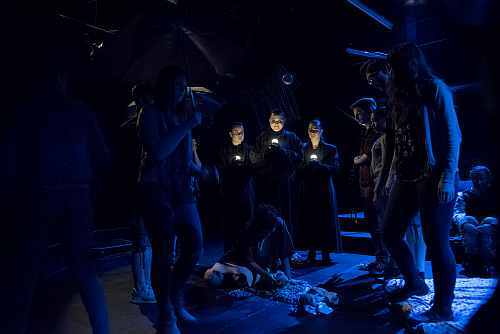 Ashlyn Kusch’s lighting design and Michelle Tracey’s set design helped. There were things suspended over the stage, a shopping cart, a TV, binoculars, a camera, a stuffed bear, a doll, fluorescent tubes, and other stuff. The fluorescent tubes were part of the lighting. Sometimes there was just one on dimly, showing where the next action was going to be. Sometimes one or more was very bright, lighting the scene. It was very effective. Student productions always amaze me. The level of talent is so impressive and this was no exception. It really does bode well for the future of theatre in Toronto. This is very much an ensemble piece, with a cast of 21 and a program credit under Characters that says “Us. Whoever we are and how many of us there may be. Performed by the ensemble.” As we left the theatre we were handed a cast list, but it didn’t really help identify anyone. The characters weren’t identified on stage. Noise was written in 2016. It’s interesting how prophetic it is, given the Stoneman Douglas shootings and resulting student activism. I believe it is young people who will save the world. As such, while I’d be hard pressed to say that I enjoyed the play, it made me uncomfortable and it made me think. Sometimes that’s what theatre does.